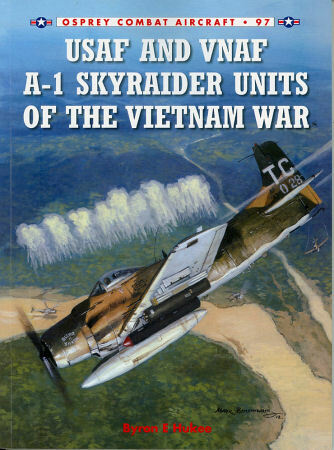 In Osprey's USAF and VNAF A-1 Skyraider Units of the Vietnam War, author Byron E. Huckee – himself an A-1 pilot in southeast Asia – highlights the units tasked with flying propeller-driven Douglas fighter-bomber. Following a short introduction and acknowledgements, Huckee recaps the Skyraider's (lovingly christened "Spad" by its pilots) design, development history and ordnance options. Successive segments focus on A-1 unit histories. Here, the author blends personal anecdotes with historical data. In one example, VNAF Capt Ho Van Hien recalls narrowly evading enemy forces after an SA-7 MANPAD missile struck his plane. Shot in both his right elbow and shin, the 514th Fighter Sqn pilot hid in tall grass until an OH-6 rescued him. Over 70 historical photographs bring the admired aircraft and her crews to life. And hobbyists will find ample inspiration from 30 color profiles by Jim Laurier. Three appendices, including a timeline, and an index neatly conclude Huckee's superb account.